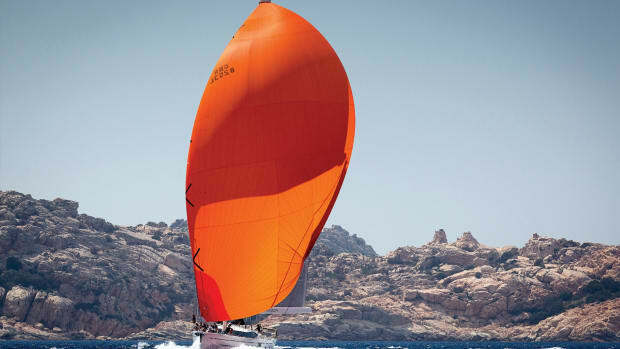 As the saying goes, “perfect is the enemy of good.” But that’s no reason not to strive for perfection, especially as part of a process of continual improvement, as Catana seems to be doing with its revamped line of sailing catamarans, the smallest of which is now the Catana 42. First launched abroad in 2010, the Catana 42 has been slimmed down by 600 pounds through the liberal use of carbon fiber in the inner skin and the SCRIMP resin infusion process. The sandwich construction also incorporates Twaron, a fiber that is 10 times more puncture resistant than classic fiberglass at half its density. The resulting weight savings and stiffness provided by this construction serves as the basis of the 42’s excellent performance. Additional rigidity comes from structural bulkheads reinforced with carbon fiber and molded into one piece, while reinforced bottoms provide additional safety when beaching. There are also four watertight bulkheads, two forward and two aft. The hulls are asymmetric and canted outward. 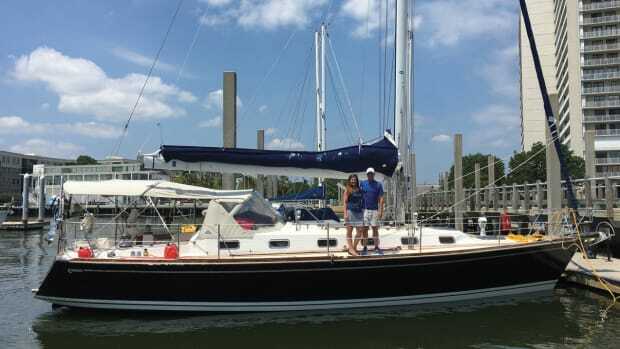 The bows are “tulip shaped” to increase reserve buoyancy and reduce pitching motion and the risk of burying a hull. The daggerboards extend down 8ft10in and help considerably with windward performance, although Catana advises raising them in heavy seas to allow the boat to slide along the waves rather than tripping and capsizing. A high clearance below the nacelle minimizes the pounding many cats experience sailing to windward. The deck and coachroof are fabricated from a single mold and cored with Corecell closed cell foam with a molded diamond-pattern nonskid. The helms are out on the hulls, which can be either good or bad, depending on your sailing style. On the down side, they’re not protected from the elements and it can be hard to see the far-side bow when maneuvering. (With this in mind, some owners have installed cameras to help them see in close quarters.) On the plus side, there’s nothing like the clear sightlines you get with an outboard helming station.  Aboard a higher-performance cat, an outboard steering position also allows you see the rig easily when threading your way through the windshifts while, say, sailing to windward. On our test boat, two electric primary winches made easy work of tacking. There were also two electric utility winches in the cockpit to do the heavy work of raising the main, cinching in reefing lines or raising the tender that is carried on the nicely integrated davits aft. Catana doesn’t specify a particular electronics package, but our test boat had a Garmin suite that included the 8212 multifunction display (chartplotter/radar)and a Garmin GC10 camera mounted on the mast. Catamarans are excellent at mixing the indoors with the outdoors. 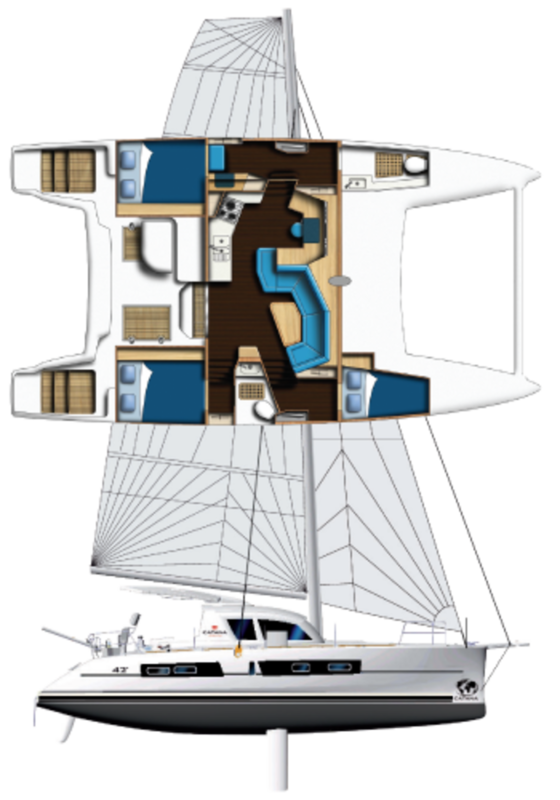 And the accommodations aboard the Catana 42 really start in the large cockpit, where an L-shaped settee to port seats four to five for meals, with additional lounge seating to starboard. From there, an aluminum sliding door leads to the saloon, which is on the same level and where a U-shaped, aft-facing settee seats four around a table with a center leaf. 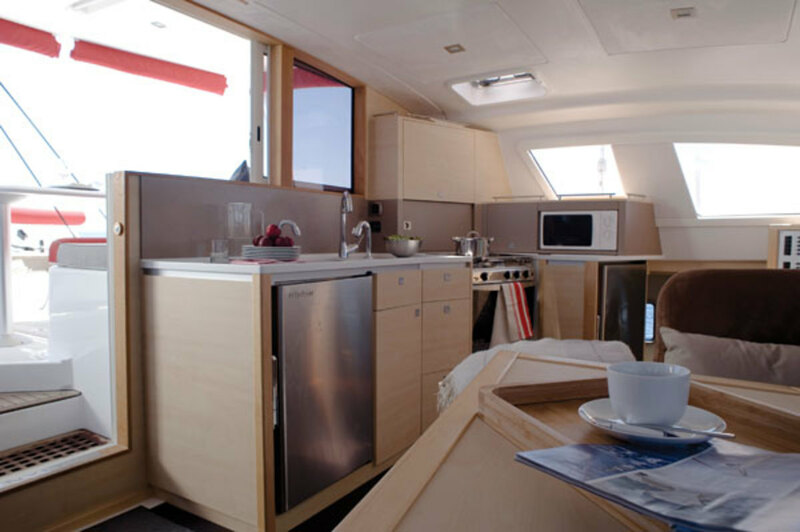 The portside galley has twin sinks, Frigoboat refrigeration (a freezer is optional) and an Ono three-burner stove/oven combo. 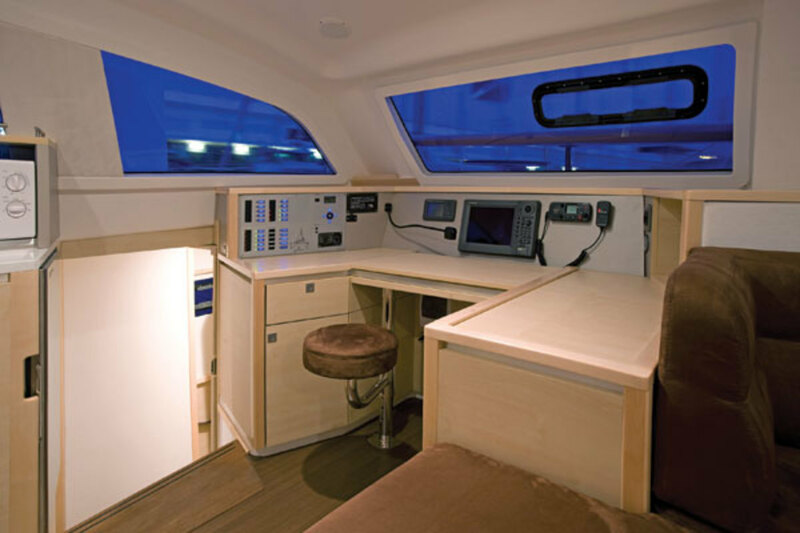 Forward of the galley is my favorite interior feature on the boat: a generously proportioned navigation station with plenty of desk space, good-sized drawers and a recessed cubby for a computer. It’s the kind of dedicated workspace that is often overlooked on today’s production cats, but will be much appreciated by a passagemaking captain. 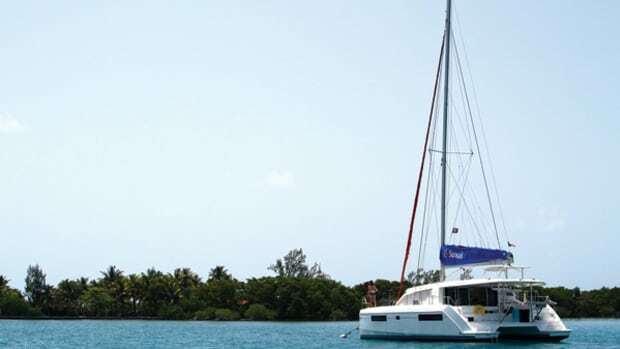 The Catana 42 is available with three or four cabins and two heads. 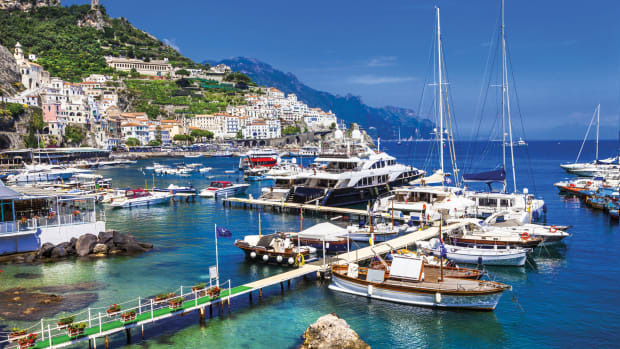 In the owner’s version, the entire port hull is devoted to the master suite, with a queen berth aft, a small desk in the midships walk-through area and a head with Corian counters in the forward hull. 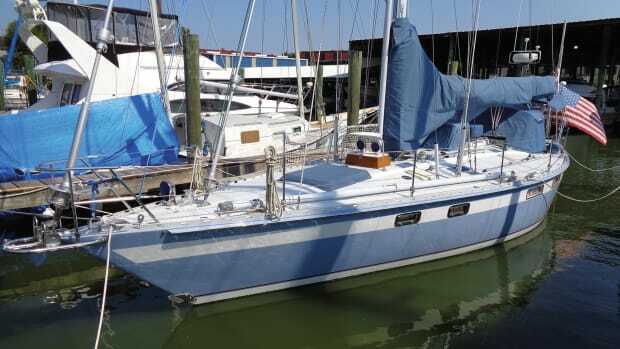 The starboard hull has guest accommodations with a double forward, a queen cabin aft and a shared head/shower arrangement that also serves as a day head. If I have a complaint here, it’s that neither head is configured to have a dedicated and truly out-of-the-way shower stall. Like much of the rest of the design, the interior furnishings are made using a lightweight foam core sandwich, in which multiple layers are skinned with a thin wood laminate and covered in a satin varnish. The purpose of the change included weight savings and creating a richer feel by mixing wood surfaces with white trim. The effect is modern, but not stark. Hull #32 had a tough job on test day. 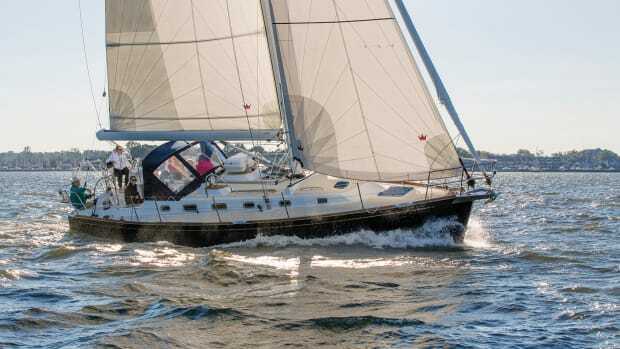 There was barely a breath of wind on Chesapeake Bay, forcing both the boat and crew to make the most of the tall Marechal rig flying an Incidences Dacron tri-radial flattop mainsail and a 140 percent genoa on a Facnor single-line furler. A smaller headsail is also available. In combination with a Stormlite polyester gennaker on a roller, this latter arrangement will undoubtedly be the easier of the two to manage under sail, especially shorthanded. On those occasions when a puff finally slid our way the boat reacted immediately. One time we even had the pleasure of gliding along at 6.3 knots with just 7.4 knots of wind on the beam. Soon afterward we bore away and slowed to 5.1 knots sailing 120 degrees true. As the breeze was dying for good, we were just about the only boat on the bay that was able to keep moving under sail. Not bad! In better conditions, the 42 has been sailed at 10-12 knots upwind and 15-plus knots on a broad reach. Auxiliary power is provided by two 30hp Volvo Penta diesels with saildrives, but our test boat had the 40hp upgrade. Similarly, two-blade fixed propellers are standard, but our boat had a pair of three-blade Volvo folding props. In flat water with little breeze, we motored back to the slip at 8.9 knots. Tankage is 114 gallons for fuel and 177 gallons for water. 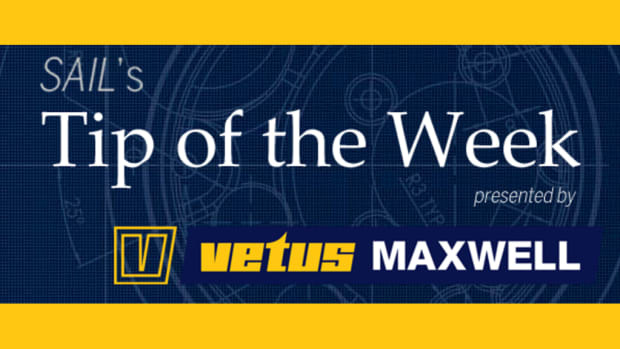 Although things were pretty tight in the crowded post-Annapolis Boat Show marina, the Lewmar Mamba rack and pinion mechanical steering spun the boat easily, and we managed to crab into an awkward dock without any problems. Some people love outboard helm stations on a catamaran. Others see it as a deal-breaker. Steering locations aside, you’d be hard-pressed to find a faster, better-outfitted production catamaran than the Catana 42. BUILDER/U.S. 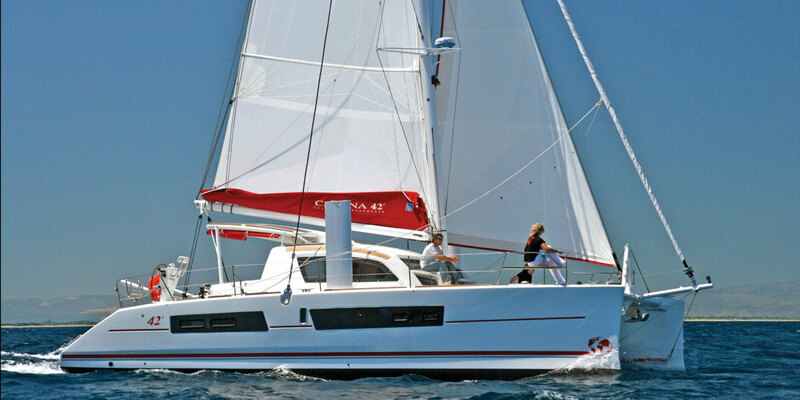 DISTRIBUTOR Chantier Catana, Canet en Roussillon, France, catana.com.